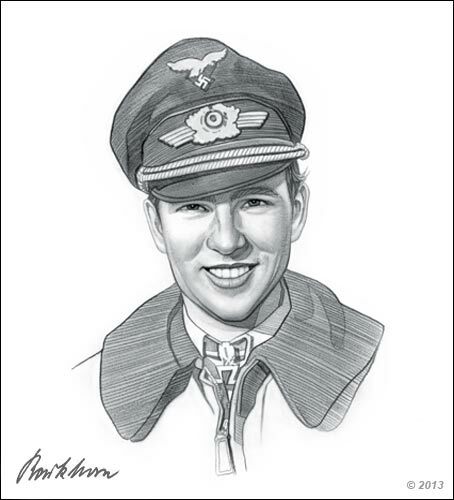 Gerhard Barkhorn joined the German air force when he was 18. Although he did not achieve a victory during his first combat, it did not stop him from doing his best in the succeeding dogfights. He was one of the few fighter aces who were feared by the Soviets. In fact, the Red Air Force had place a price to his head. They desperately wanted him killed as he was single handily decimating the Soviet Air Force. On March 20, 1919 at Königsberg, Prussia, Gerhard Barkhorn was born. At the age of 18, he joined the Luftwaffe and became a Fahnenjunker. He began his pilot training after serving a year in Luftwaffe. After he completed his pilot training, he was assigned as a Lieutenant and worked with Jagdgeschwader 2 Richthofen. This was an old unit formed during World War I. 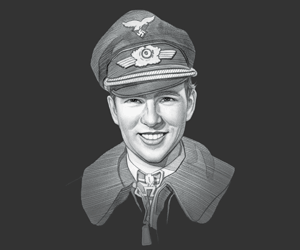 He was trained by one of the existing fighter ace pilot, Franz Stigler. May 1940 His first combat battle during the Battle of France and Britain but he was not able to claim any victories. July 1941 His first victory against the Soviet air force. Nov 1941 He was promoted as Oberleutnant for winning 10 aerial combats. May 1942 He was appointed as the Staffelkapitän of 4./JG 52. July 19, 1942 He became an "ace in one day" for destroying 6 aircraft in his Bf 109F fighter. August 1942 He was awarded the Ritterkreuz for destroying 59 Soviet aircraft. Oct 1942 He returned to combat. Jan 1943 He received the Oak Leaves to his Knight's Cross. Feb 1944 His unit was able to tally 350 victories, 50 of these victories were personally claimed by Barkhorn. The Soviet Red Air Force placed a price on his head. March 1944 He was awarded the Knight's Cross with Oak Leaves and Swords. He also attended the wedding of Erich Hartmann where he acted as Best Man. May 1944 He was promoted to Major. May 1944 He claimed his 273rd victory but he was shot down by a Soviet P-39 Airacobra. Luckily, he was able to crash-land far from enemy lines. Sep 1944 He tallied 15 victories. Nov 1944 He tallied 23 victories. Dec 1944 He tallied 28 victories. Jan 5, 1945 He was able to score his 301st combat victory. Jan 16, 1945 He was assigned as Geschwaderkommodore to Jagdgeschwader 6 (JG 6). The unit was composed mostly of new recruits. They had many losses which resulted in him being advised to rest due to the physical and mental strain of command. Apr 21, 1945 This was his last mission, he was attacked by P-51 Mustang fighters which severally damaged his aircraft. He was able to crash-land but suffered major injuries. Sep 25, 1945 He was released following being taken prisoner by the Western Allies. 1956 He joined the Bundesluftwaffe and was promoted to commander of the JaboG 31 “Boelcke”. 1976 He retired with the rank of Generalleutnant. Barkhorn and his wife, Christl, were involved in a car accident on January 6, 1983 during a winter storm on an autobahn near Cologne. His wife died on the spot and he was rushed to the nearest hospital. He died 2 days later due to major injuries. The couple were buried in Tegernsee, Bavaria. Being one of the fighter pilots who was tagged “ace in a day” for destroying 6 kills in one day he was highly respected by both friend and foe. Front Flying Clasp of the Luftwaffe in Gold with Pennant "1,100"
This picture of Gerhard Barkhornis Copyright © June 2014 Siteseen Ltd. We only allow this picture to be used for printed non-commercial purposes and particularly encourage it's use for printed educational non-commercial purposes. This Gerhard Barkhornpicture is not in the Public Domain. 3) Use of this Gerhard Barkhorn picture, or any of our pictures on websites re-distributing copyright free material is strictly prohibited.